September 5, 2012 - The first wing for the A350 XWB has arrived at Airbus’ final assembly line in Toulouse (France) where the new generation Airbus wide-body aircraft is being assembled. This first wing, which will not fly, is destined for the A350 XWB airframe used for static structural tests on the ground that all new aircraft undergo as part of their certification process. 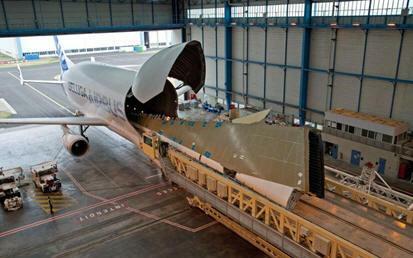 The A350 XWB wings, as for all Airbus aircraft, are made at Airbus’ Broughton (UK) site. The A350 XWB wing covers are 32 metres long by six metres wide, making them the biggest single civil aviation parts made from carbon fibre composite material. The wings’ advanced structural design and superior aerodynamics are both significant contributors to the 25% fuel saving performance of the A350 XWB. The Airbus A350 is a family of long-range, wide-body jet airliners under development by European aircraft manufacturer Airbus. The A350 will be the first Airbus with both fuselage and wing structures made primarily of carbon fibre-reinforced polymer. It will carry 250 to 350 passengers in three-class seating, depending on variant. The A350 was born as an A330-derived minimum-changed competitor to the Boeing 787 Dreamliner and the larger Boeing 777, but was unanimously rejected by prospective customers. Airbus was forced to redesign the initial proposal, but airlines voiced support for a complete overhaul. The eventual proposal incorporates major changes, which Airbus says will be more fuel-efficient, with up to 8% lower operating cost than the Boeing 787. The redesigned A350 was marketed by Airbus as the A350 XWB, where the XWB stands for Extra Wide Body. The launch customer for the A350 is Qatar Airways, which ordered 80 aircraft across the three variants. Development costs are projected to be US$15 billion. The airliner is scheduled to enter airline service during the second half of 2014. As of 20 January 2012, 561 orders had been placed for the new aircraft.